When it came time to scour Vegas for pizza, we knew that there was only one person to send. Our resident-self proclaimed- pizza expert hails from the big apple and claims to know a good slice just by sight and smell. Knowing this, and the fact that he was going to love this assignment just a bit too much, we challenged him to find our Vegaster users not only the best pizza joints, but the best non-pizza item on their menu. Get you napkins ready, ‘cause our “by the slice guy” is about to make things messy. D.O.C.G. at the Cosmopolitan: It doesn't seem like you should be calling this restaurant a joint until you sit down and feel how relaxed it is. The name comes from some Italian mumbo jumbo for high quality Italian wine, but none of the pretense of that, nor the Cosmo should hold you back from kicking back and getting a really, really tasty pizza. Best non-pizza pick was fried olives of all things stuffed with pork. This was entirely new to me, and the reason why I’ll be going back. Five50 Pizza Bar at the Aria: Again, these high falooting hotels are finally catching on that the way to good pizza is to do it like on the east coast. Five50 is the exact oven temperature you need for that perfect blend of melted cheese and crispy crust. Exactly what I got at this surprisingly laid back pizza joint. It should also be mentioned that no matter how much Vegaster is paying, all of my pizza picks are based on classic toppings, none of that runny egg on a pizza that I saw on this menu. Best non-pizza pick? So they have this shake menu… where you can add booze, so my pick was this incredible pumpkin pie ice cream shake with Captain Morgan. Heaven in a glass. Metro Pizza: Metro is something like a chain in Vegas with like 5 different places you can get a pie. But don’t think like Dominoes-type chain. This is authentic real pizza that tastes friggin’ amazing. They claim to be descendants of the very first pizzeria in Manhattan. Whether true or not, the Olde New York pizza I had was right on the money. My best non-pizza pizza joint pick was these little slider sandwiches made with shrimp and Diavolo sauce. Spicy hot and hits the spot. Pizza Rock: I went into Pizza Rock with reservation. Everything I read said gourmet, which is definitely not me. Lucky for them, they list the classics before they start with that egg on a pizza thing. (is this something new?) and I got a taste of an “everything” pizza just the right blend of meat and veggies without anything I couldn’t pronounce. Best non-pizza pizza joint pick? Certainly not any of that gluten-free stuff they had going on, but rather the deep fried meatball calzone, crisp and doughy, just the way I like it. 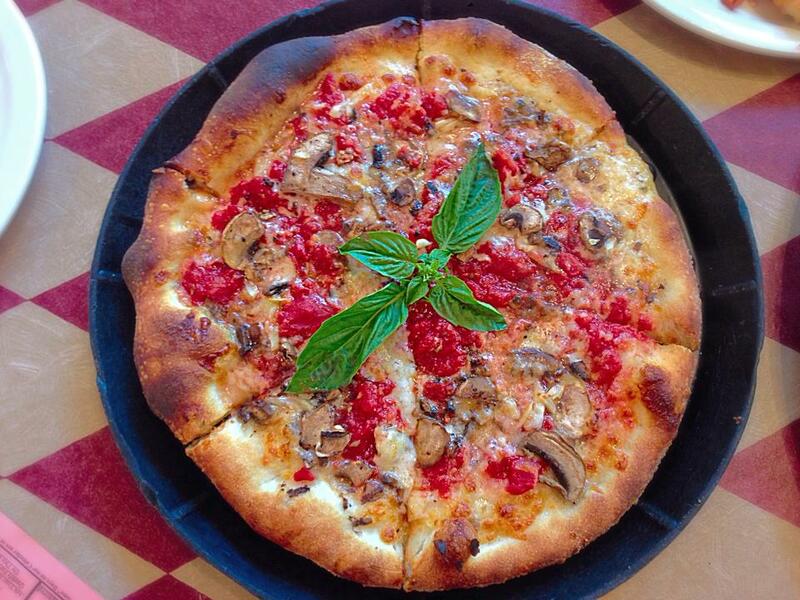 Slice of Vegas Pizza: They’re not kidding when they say fun Italian. Inside of the Shops at the Mandalay is the hometown feel Italian spot that makes you want to hang out all day people watching. The staff was quirky, the atmosphere light and there was a build your own pizza spot on the menu. I kept mine old school with extra cheese and ‘shrooms, washed down with a draft. Best non-pizza pizza joint pick had to be the cannoli. Filled to order, this was the crunchy sweet treat that a cannoli is supposed to be. Engine One Pizza: There’s always gotta be that one pizza guy who finds a way to take it to the next level. Typically a catering operation that brings pizza dough to your door and then makes you the pizza, I caught the truck on the first Friday of the month in front of the Gypsy Den. (If you don’t know where that is, your Vegaster app can tell you) No need to worry about divvying up pizza on the street, these guys do by the slice to make everyone happy. Best non-pizza pick was a side of wood fired mushrooms, made to order in the same wood stove as the pizza is made in. 800 Degree Pizza at Monte Carlo & SLS: This was probably the best, most authentic wood fired pizza I found, and not surprisingly considering the locations. Everything in Vegas is amazing, right?!?! We hit up the Monte Carlo location to get our grub on. 800 Degrees makes getting some solid pizza as simple as pie. Located right on the main strip right in front of Monte Carlo, this party is hard to pass up. Think Chipote meets Sicily. Start with your base of crush and move down the line with topping after topping. Custom everything or pick a house favorite. We opted to custom this baby out with Pepperoni, Pineapple, Roasted Tomatoes, with an extra splash of Olive Oil. The best non-pizza pizza joint pick has to be the crazy good and the fresh red pepper sauce, topping, dipping sauce. Just try it, start light, it can get hot and spicy rather quickly! My tastes, of course, were a bit very biased. There is plenty of great Chicago style joints, and even California (ugh) style pizza joints to check out. Vegas knows good food, especially when it comes to pizza.